A heart-wrenching saga of revolution, regret and family secrets... For fans of Nadine Dorries, Maeve Binchy, Freda Lightfoot and Dilly Court. For centuries. generations of the Jenkins family have eked out a living from their Carmarthenshire hill farm. But when a fire destroys virtually all of their possessions the children witness their lives crumbling around them. Mary and William find they have barely enough land left to provide for their basic needs. Their only option is to take on more work, but William longs for action, and Mary begins to suspect that he has become embroiled with the Rebecca-ites, a shadowy group of nationalists pitted against the English landowners whose tolls have bankrupted so many Welshman. 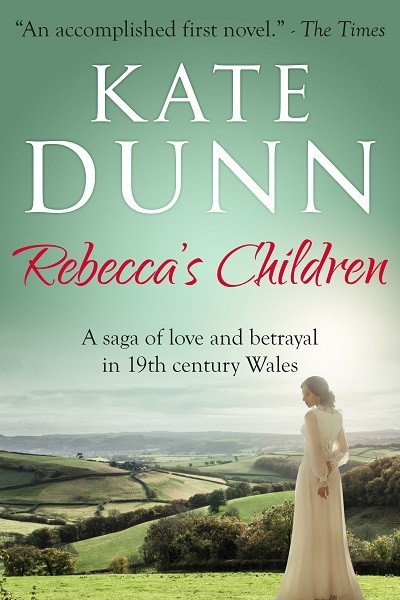 Rebecca’s Children by Kate Dunn is a poignant, beautifully crafted saga of love and betrayal, set against the background of Wales in mid-1800s – a country aflame with political and social unrest.